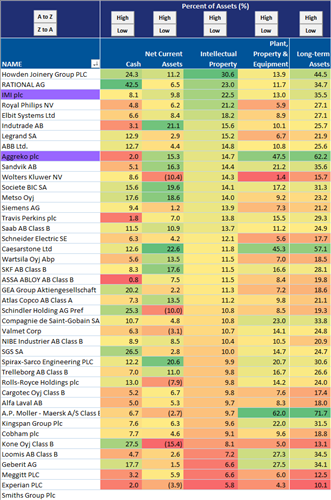 The other day, we took a look at the recent bounce in DM EMEA cyclicals and the perky performance of some names in the Industrials sector, in particular (see here). 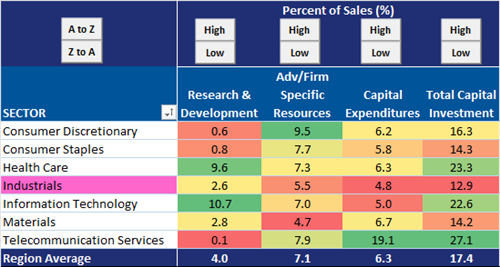 For those interested in a deeper dive into how these companies stack up when it comes to the question of Knowledge Leaders, read on– and note that all data shown has been adjusted to include investment in intangibles as exactly that: an investment. 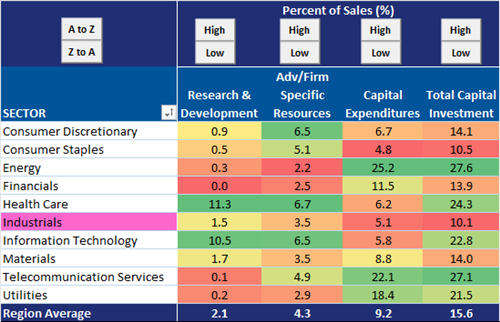 On average, DM EMEA Industrials only invest 1.5% of sales on R&D (a far cry from the 10%+ investments by the average Health Care or Technology companies in the region). They also invest less than average on other intangibles like advertising and firm-specific resources. 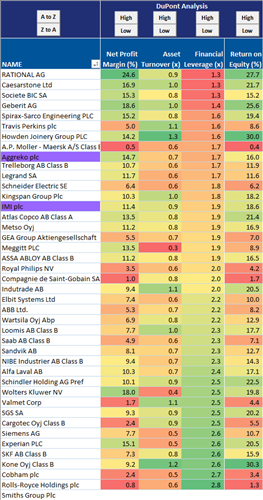 When taken in aggregate, the sector fails to meet our minimum 5% threshold for knowledge intensity. 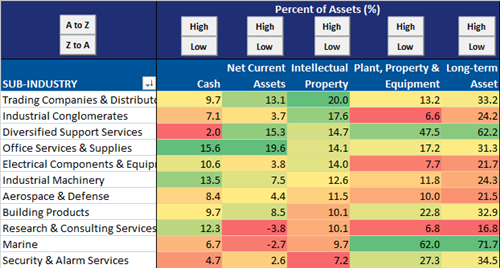 As a result of low overall investment in intangibles, we find relatively little in the way of intellectual property assets on Industrials’ balance sheets. 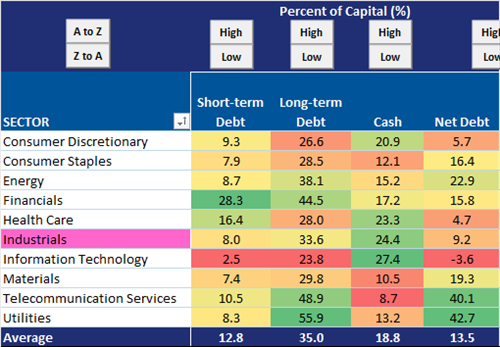 On the bright side, however, the sector has managed to keep debt levels relatively low with net debt as a percent of capital just over 9% compared to an average of more than 13% and extremes in the Telecom and Utilities sectors of more than 40%. 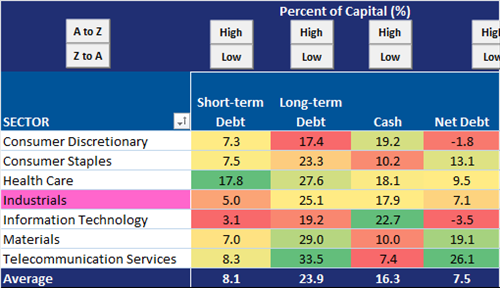 Familiar readers will not be surprised to find that the profitability of these knowledge laggards trails that of companies in nearly every other sector. 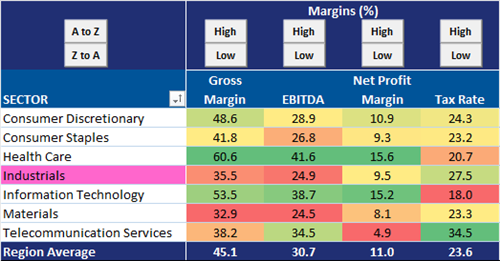 DM EMEA Industrials have the third lowest margins (gross and net) and the worst operating cash flow margin of any sector. 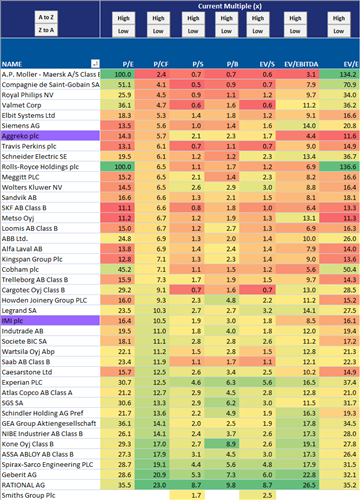 Adding insult to injury, these companies are trading at a relatively premium to their 10-year averages on most valuation metrics (ranked here by price to sales, highest to lowest). All in all, not a very impressive showing. However, when we look at the same variables and only focus on the companies that have passed our screening process to be designated Knowledge Leaders, we start to see a more promising picture. 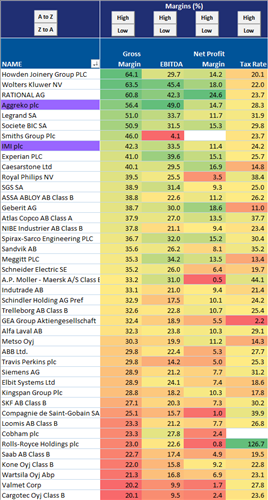 Note that some sectors have ‘disappeared’ entirely in the following tables because there are no Knowledge Leaders in those sectors in DM EMEA. 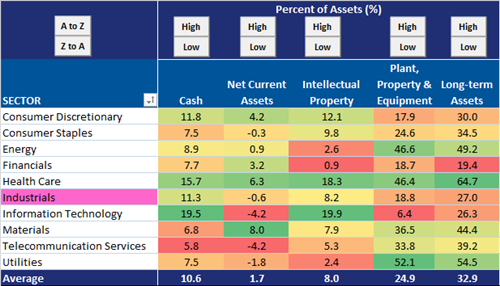 In general, we find the familiar trend that higher spending on intangible investments like R&D, advertising, and firm-specific resources results in a larger stock of those assets on the balance sheet. Gross margins more than 35% and operating cash flow as a percent of sales greater than 20%. The sector still lags Knowledge Leader peers in more intangible-intensive groups like Technology and Health Care, but their efforts should not go overlooked completely. 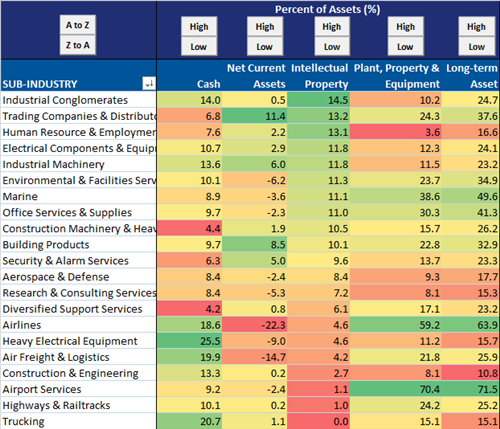 Going beyond the sector-level view, we can see exactly which sub-industries are the most knowledge rich. Again, we see fewer sub-industries when we filter down to Knowledge Leaders only because no companies in a less knowledge intense group– such as Trucking, for example– manage to pass the screening process. 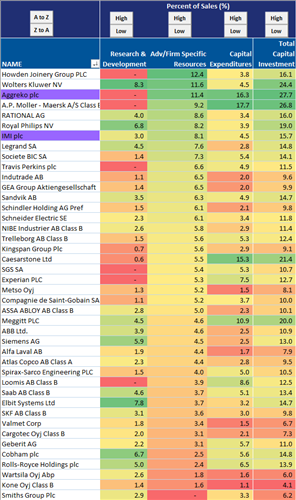 Of the ~40 Industrial companies in DM EMEA that qualify as Knowledge Leaders, there are a couple of names that not only caught our eye in the point and figure charts, but that also appear at or near the top of the group when we take a closer look at fundamentals. 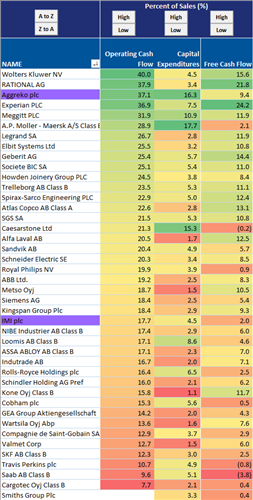 IMI Plc and Aggreko Plc both spend about 1.5-2x the average on advertising and firm-specific resources. Intellectual property assets account for 15-20+% of total assets. 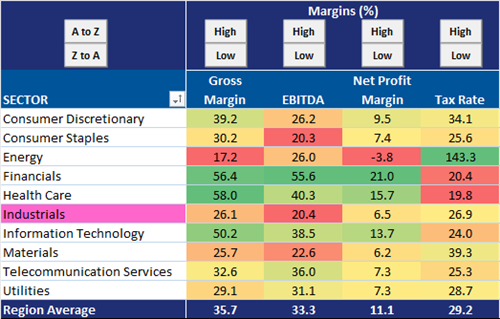 Gross margins are greater than 42% for IMI and more than 56% for Aggreko. 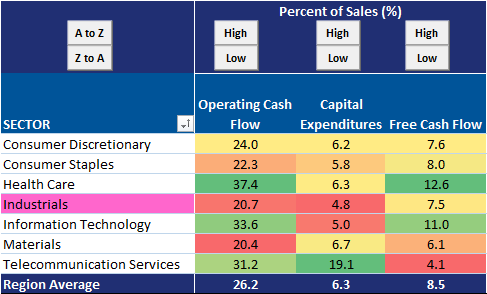 Aggreko stands out further with respect to operating cash flow margin (near 40%). They employ some of the lowest financial leverage of the group. 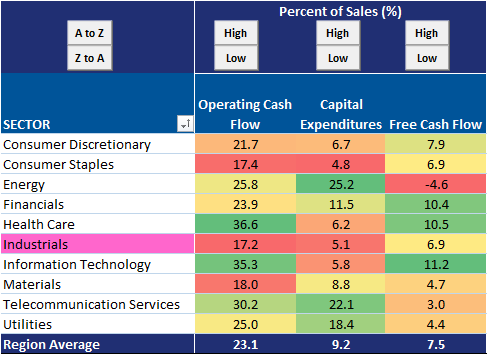 And, finally, Aggreko currently trades at just 5.7x intangible-adjusted cash flow (a 20% discount to its own 10-year average and a 40% discount to the MSCI World) while IMI is slightly higher at 10.5x P/CF. In a group that might be easily dismissed for any of the factors mentioned here or in the post earlier this week, those with a focus on intangible investments truly do stand out like diamonds in the rough.